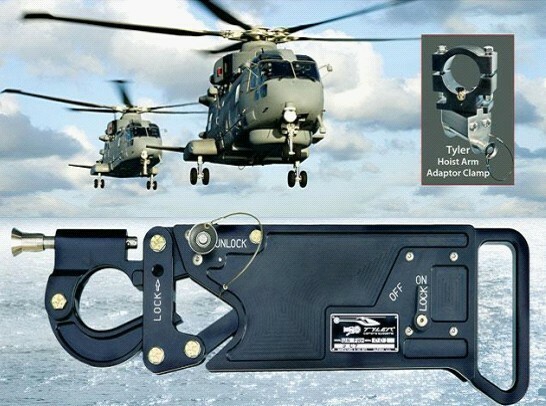 Unlike the “standard” Tyler Fast Rope Release Hook for the Eurocopter AS350/355 or the MD-500 series helicopters where the pilot or co-pilot operates the hook via a cable and handle lever, the Tyler “Universal” Hook is designed to be operated on large helicopters by a crewman at the door or rear ramp. The hook is operated by a pull handle at the rear of the hook. There is a two-position safely latch for normal operations as well as a lockout pin for training exercises. The Universal Hook is designed to be mounted on existing hoist or repelling arms located at large helicopter side doors or rear ramps. Large diameter or normal repelling ropes can be used. The hook weight is seven pounds. Size is 2” X 6” X 20”.